A few weeks ago we talked about e-merchandising and different ways of improving your homepage. This week we’re looking at another aspect of e-merchandising - product pages. Optimised product pages are a great way for your customers to get more information on specific products, and when customers find what they’re looking for, sales increase. Optimised product pages are also brilliant for increasing your ranking with the search engines. I- Ensure you’ve got great pictures! A picture is worth a thousand words – and that goes double for e-tailers! Enticing pictures will encourage your site visitors to slip your products into their basket. So, what’s the secret for great pictures? Your online customer will be able to imagine him or herself with the product: how to use it, where to put it, what it goes with, etc. The more perspectives you offer, the better the customer will be able to imagine what it will be like to own it. So get snapping! b. Enlargements and close ups! The more details a customer can see, the more comfortable she’ll be about buying the product. She won’t be unpleasantly surprised by some unseen detail when the packaging comes off. 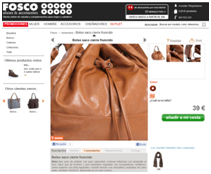 Follow Fosco’s example: they offer online customers a zoom function so they can take a closer look at details like stitching on bags and shoes. Adding videos and/or animation to your e-shop will liven things up considerably. Think of it as an added way for the visitor to imagine himself with the product. Some e-shops even offer virtual trials, which proves that customers enjoy picturing themselves with the product, helping them avoid purchasing mistakes. Is the product in stock? What are delivery times and costs? What are the product dimensions? What are the care instructions? As your online customers will be asking these questions when looking at products, you’d do well to provide them with the answers! To encourage customers to read the descriptions, it might be good to put your description in a call out in the centre of the page, and ensure the text is well-spaced and properly organised. Your online customer doesn’t want to read everything – just find the answers to their questions. Madame Choup, for example, has organised their product descriptions into 3 sections: Info/Care, Delivery and Product Satisfaction. Visitors to this site can easily find what they’re looking for without wading through details that don’t interest them. A product description on the Madame Choup site. Cross-selling is a sales technique that proposes complementary or similar products to customers interested in a specific item. This strategy can have a huge impact on the average basket as well as increasing the visibility of certain products. For an example of cross-selling at work: if you’re selling a computer, you could propose a mouse, keyboard or screen as related products. Cherry dog uses this technique, with associated products displayed to the right of the main picture on the product page. If you’d like to add this approach to your site, we have an Addons module that allows you to have a sidebar to display related products..
Internet users appreciate being able to share their opinions and favourites. This strategy enhances word of mouth publicity – a free and effective way to get people talking about your company. And it’s a good way to impact your sales and increase your customer base. If you’d like to use a comments function, or a function for customers to share pages with the social networks, we have a module available that will help you set it up quickly. We have 2 final tips to help you optimise your product pages: Be creative and tailor your pages to suit your activity. Be original – you’ll soon see the benefits! Finally, don’t forget that optimised product pages are great, but you’ll need to back them up with solid merchandising and clear page categories!